McAllen Memorial's Sydney Marburger, Newcomer of the Year at McAllen Memorial on Monday Dec.11,2017, in McAllen. McAllen Memorial sophomore setter Sydney Marburger is The Monitor’s All-Area Volleyball Newcomer of the Year. McALLEN — The 2016 volleyball season was the conclusion of one Marburger’s varsity career, while the 2017 season marked the beginning of another Marburger’s varsity career. 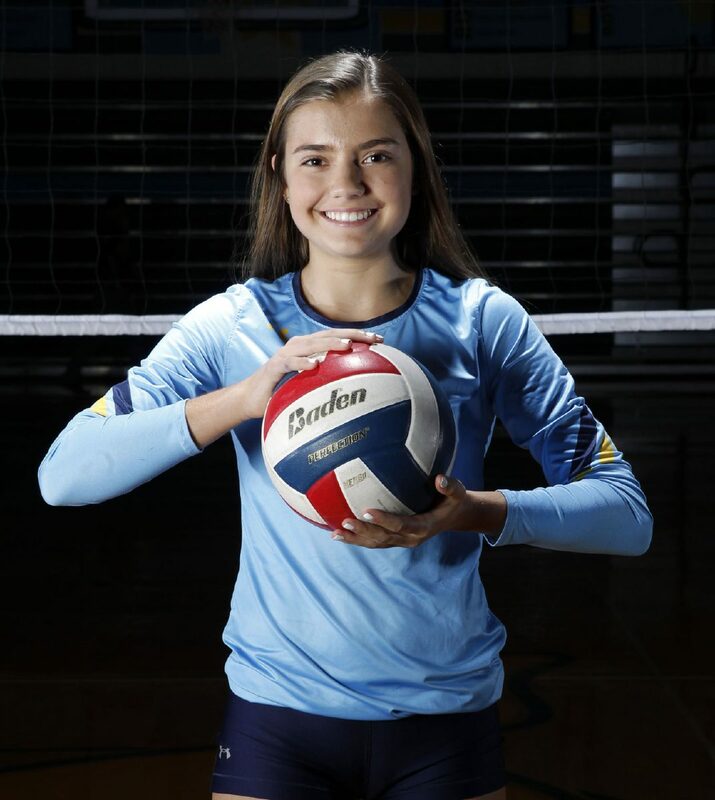 On her way to graduating last spring, McAllen Memorial setter Taylor Marburger earned The Monitor’s All-Area Player of the Year award as a part of the 40-win Mustangs team that went four rounds deep into the playoffs. The Mustangs returned only one senior to this season’s starting lineup, with several players contributing in roles previously unfamiliar to them. One of those players is Taylor’s younger sister, Sydney, who is also a setter. As a sophomore this season, Sydney’s contributions not only won her Newcomer of the Year honors within District 30-6A, but they also earned her The Monitor’s All-Area Newcomer of the Year, as well. Marburger accumulated 955 assists, 45 aces, 213 digs and 35 kills during her first varsity season as one of the key leaders who helped the Mustangs (31-9) qualify for the program’s third Regional Semifinal playoff run in a row. Sydney’s sister, Taylor, recently wrapped up her freshman season on the volleyball team at Baylor. Like Sydney, Taylor won the district’s Newcomer of the Year award when she competed in her first year of varsity volleyball.